On the main game, rushing is king. There is no more efficient way to reach the end game, no more powerful way to play the game. It is heavily designed in ways that smart, strategic rushers can take advantage of - note the "smart" and "strategic" there though. If you rush and don;t know what you're doing, you will crash and burn. The Builder's Base just isn't the same yet. First and foremost, there are only five levels in the game. Secondly, it's so new that the trophy ranges, tactics, base designs, matchmaking, and other aspects of the game are still very much in flux. Skill levels change almost daily across all trophy levels; today may be easy pickins whilst tomorrow is a No Wins Sunday. BH levels tend to hold certain trophy ranges for a day until the new crop comes in and they move up. I have six games going and BH4 has become the most frustrating of them all. (I've no doubt BH5 will usurp the crown as soon as BH6 is released and we're dealing with the two Crushers instead of one.) One of my BH4 games that is fairly well along, lost several hundred trophies today. Every opponent was BH5 and all were mid-level or higher at that; something even a near max BH4 cannot manage. By the time I dropped down to 1500 trophies again, things evened back out. Of course, the lower trophy ranges also mean less loot earned after wins and that runs to slower progress. You would think this would encourage rushing...but it doesn't; in fact, it has the opposite effect. The loot cap of three wins makes it difficult to get enough resources to buy the items and upgrade the troops so one can effectively compete at the higher level. Rushing out of BH3 is challenging for all the reasons I mentioned yesterday and today; not having the resources for the fourth camp has literally set my game back 2-3 days just recovering. Had I played on day 6, I would;d have been able to get the fourth army camp and today would see me at closer to 1200 trophies and probably the Guard Post would be down, not to mention the lab upgraded and/or more troops upgraded. On the other hand, maxing BH4 has not been easy. I described my BH4 attacks today above; the BH5s I am facing now are far more sophisticated in every way when compared to the BH4 I upgraded to BH5 a few days ago; and that one was further along than where the one today is at! My main game, BH5, got its level 10 Baby Dragons today. I gotta say...it was really fun demolishing BH5 bases with the level 10 BDs. I went from 2200 trophies all the way up to 2939 trophies before I adjusted back down to around 2800. Right around 3000 trophies, there is a diamond base design that effectively deals with maxed BD, so long as you upgrade your air defenses a bit. 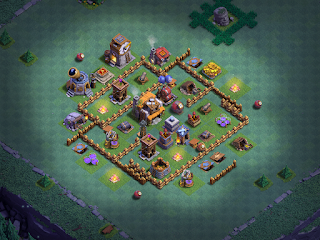 I tweaked it a little to my own preference, but it has become my default BH5 base for the time being. I even have a version for my new BH5 that doesn't have the Battle Machine yet.